File Name: Guillermo "Willie" Suarez of Havana, Cuba. Notes: Havana is Cuba's capital and largest city, located in the western portion of the main island. The other Caribbean characters are Zanzibar of the Cayman Islands, Gristle of Montego Bay, Jamaica, and Rampage of the US Virgin Islands. To my knowledge, Snow Storm was never animated. Accessories: white pistol (88 Shockwave's), white submachine gun (88 Hit & Run's), white rifle (90 Bullhorn's), red-brown spring missile launcher with white trigger (93 Cross-Country's), two white spring missiles (93 Bazooka's), white knife (88 Hit & Run's), white figure stand (common). SNOW STORM was recruited for the G.I. Joe team after COLONEL COURAGE saw him defeat an entire band of hostile revolutionaries who were trying to infiltrate a peaceful Caribbean village. 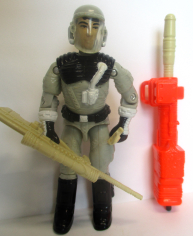 Snow Storm accepted the Joe's offer but disliked his first assignment: trying to stop Cobra Vipers from attacking a science station at the north pole. He wasn't afraid of the Vipers; he just hated the cold! Nevertheless, he accomplished this frigid mission (and many others) with great success. After being given a customized, high-tech thermal suit to wear, he agreed to stay in the Arctic where he functions so well at pulverizing Cobra! Motto: "If only I wasn't so good at my job, maybe I'd get assigned somewhere SOUTH of the equator!" Toy Notes: Item #6779. 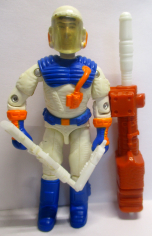 Originally intended to be part of the canceled 1993 assortment of Eco-Warriors. Note that Snow Storm's motto makes no sense geographically. Toy Notes: Item #6779. A running change, moving away from the color scheme originally conceived for the Eco-Warriors. 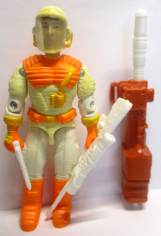 Accessories: cream-colored pistol (88 Shockwave's), cream-colored submachine gun (88 Hit & Run's), cream-colored rifle (90 Bullhorn's), red-brown spring missile launcher with black trigger (93 Cross-Country's), two cream-colored spring missiles (93 Bazooka's), cream-colored knife (88 Hit & Run's), cream-colored figure stand (common). SNOW STORM was recruited for the G.I. Joe team after COLONEL COURAGE saw him defeat an entire band of hostile revolutionaries who were trying to infiltrate a peaceful Caribbean village. 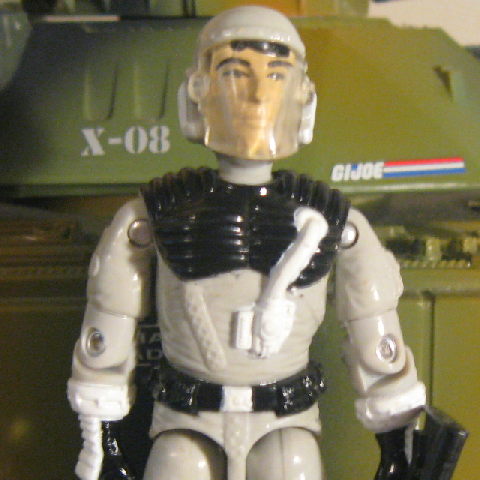 Snow Storm accepted the Joe's offer but disliked his first assignment: to stop Cobra Vipers from attacking a science station at the north pole. He wasn't afraid of the Vipers; he just hated the cold! Nevertheless, he accomplished this frigid mission and agreed to stay in the Arctic where he functions so well at pulverizing Cobra!